I will never forget the day when, as chaplain in the hospital, a young couple came into the chapel. I naturally asked how they were and if I could be of help in any way. They told the story of when they had sat alone in the hospital chapel and tried to ask God for help. They had returned simply to say thank you to God for the support they had received. 'We don't know how to pray, we don't know what words to use, could you say a prayer of thanks on our behalf?' It was a pleasure to hear their story and to pray with them. During Lent we will begin a series of evenings led by members of our different churches, exploring and discussing the way Jesus responded to the disciple's question. 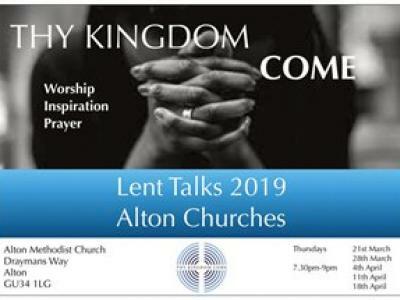 Under the heading Thy Kingdom Come... we will, over five weeks, unpack Jesus' teaching on the Lord's Prayer, meeting in Alton Methodist at 7.30pm. We felt that this series will prepare us for the 'Thy Kingdom Come' prayer initiative introduced by the Archbishop of Canterbury in 2016 calling Christians to pray for the work of the church and the world in which we live. Not only that but to pray for people to learn, discover and come to enjoy the Christian faith. As last year, we are invited to especially set aside time to pray in the ten days between Ascension Day and Pentecost (May 30th -June 9th). In a fit of wonderful enthusiasm our Superintendent Minister, Rev Chris Blake is going to lead a prayer walk around all the churches of our Methodist Circuit during those ten days. He invites us to join him on some or all of the walk! The plan is to gather at a different church each day and begin with a short time of prayer. Then to walk along footpaths wherever possible to the next church, and as we walk to both share conversation and to pause and pray along the way. Some of the walks are just an hour long, others, for example from Rowledge to Alton a little more challenging! At the end of each walk the receiving church is asked to provide refreshments and again there will be a short time of prayer. Details of the Prayer walk are now available, outlining Chris's plans and we would encourage you to consider either walking with him and/or sharing in the prayer times wherever possible. In addition, there will be a Circuit Ascension Day Service at 'The Spire' Farnham on 30th May at 7.30pm to begin 'Thy Kingdom Come' and conclude with Sunday Worship on the Day of Pentecost. Dear Friends, March brings with it the joy of spring. 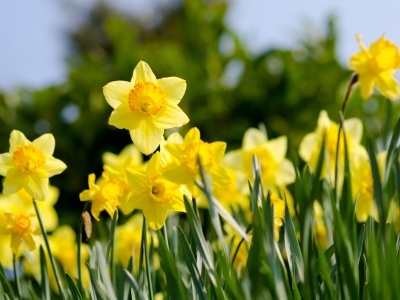 The deadness of winter is over and signs of new life are seen everywhere from lambs in the field, blossom on the trees, seeds beginning to grow and daffodils flowering in a blaze of colour.